We have not had consecutive sunshine or warmer weather in forever! I hope where you are that you are able to enjoy this spring like weather. Romeo and I packed up the car and headed out of town for the weekend. We made a quick stop to pick up a bushel of oysters to enjoy on our trip at our local fish market. and it is right on the river………. You go to the window……give your order……. Just teasing…..but that would be sorta funny if you did. Bet it would help their marketing. But until they get with the program or ask for my input…..you just give your order….getÂ a number…..and you can wait in rockers or picnic tables under age old oaks. No dollar menu at the FIsh Market…….Dang it. Look! Sean Hannity is at the Fish Market! Just teasing……this is Sean Hannity. Romeo’s cousin keeps telling me how much he thinks Romeo looks like Sean Hannity that I thought I would see for myself…….Eyebrows…..hair…..I can sorta’ see it. But anyhow….as we were on the road this weekend and spring is in the air, I thought I would share what I am hoping will somehow materialize and make itself to my house while I am gone. My Valentines wreaths need to go to storage heaven and a lovely spring wreath or two needs to take their place. 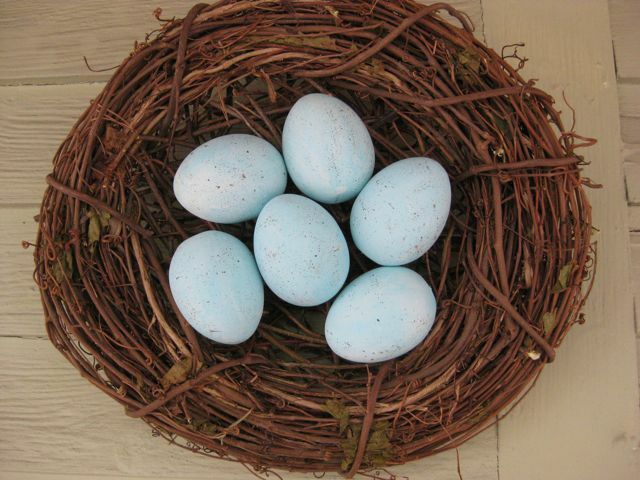 Check out these links for some great ideas on how we can bring spring into our homes! Have you every thought of using brown paper lunch bags like this? Taylor did at MaryJanesandgaloshes……..for real. What about this cutie? Another blog and another great idea. How sweet is that? Would you put this on your door? Display it? Mega Crafty will show you how to do it step-by-step…..didn’t even seem that complicated to me! So that means it’s easy! And if you have extra spring fabric, check this fresh, spring wreath out! Paisley and Polka Dots will show you step by step! All righty all……I am looking for some kind of fresh green wreath for my front door. I would love you to tell me about any neat spring ideas on your blogs! I will share them with others and link up to your site! Go enjoy what I hope is a sunny day where you are…..if not…..bring the spring to your home with a fresh spring project or craft! Spring!? We are in the middle of a blizzard in Wisconsin! It’s the umbrella planter. I love it! Kelli….how Kee-uuute are your ideas! Would love to share them here and will link up to your site! Great job! Molly…..if you make that cutie umbrella share it! Sooooo cute! Thanks for sharing and thanks for the mention on your blog! Keep up the good work!